Antarctic Science provides a truly international forum for the broad spread of studies that increasingly characterise scientific research in the Antarctic. Whilst emphasising interdisciplinary work, the journal publishes papers from environmental management to biodiversity, from volcanoes to icebergs, and from oceanography to the upper atmosphere. 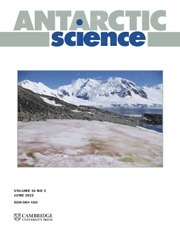 No other journal covers such a wide range of Antarctic scientific studies. The journal attracts papers from all countries currently undertaking Antarctic research. It publishes both review and data papers with no limits on length, two-page short notes on technical developments and recent discoveries, and book reviews. These, together with an editorial discussing broader aspects of science, provide a rich and varied mixture of items to interest researchers in all areas of science. There are no page charges, or charges for colour, to authors publishing in the Journal. One issue each year is normally devoted to a specific theme or papers from a major meeting.